"Design is something that I have always wanted to do, making a product or designing a product. My family are involved with design; we are very creative. I wanted to certify it and go into design in the future,” says William Shaw. 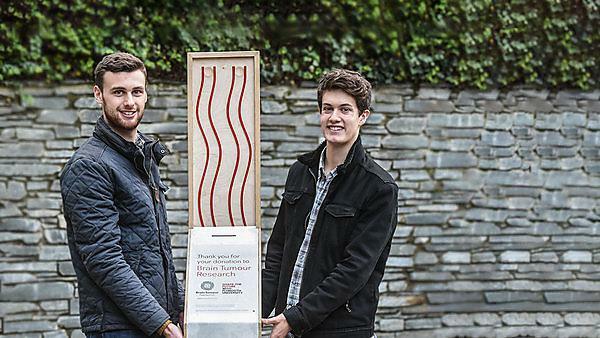 Along with Mark Hedley; William, a third year undergraduate studying BA (Hons) 3D Design at Plymouth University was approached by the University to create five donation boxes for Brain Tumour Research and the Derriford Research Facility. The donation boxes have a unique structure and design to them, which the students came up with entirely on their own. To celebrate the hard work from the students, a special unveiling event was held at the Plymouth University Peninsula School Medicine and Dentistry at the John Bull building, after a lab tour. A lab tour gives the public a rare view of the Brain Tumour Research Centre of Excellence at Plymouth University and a chance to meet the scientists undertaking world-leading research into low-grade brain tumours and pioneering non-invasive treatments. It is also an opportunity to place a tile on the Wall of Hope, a permanent recognition of the funds raised through the efforts of the charity’s supporters. This project has meant a lot to the students, they are so proud of the work they have achieved, and the great cause the money raised through their donation boxes will go to. Mark added: "This has been an immensely satisfying project. It’s been great to work on a design that will have a tangible effect, for a cause that needs support. This project is by far the most impactful I have had the joy of working on." Will concluded: "It’s been really beneficial to design and work on a project that is going to be in the public eye. It feels great doing work for a really good cause. The tour really educated us in Brain Tumour Research, and the amazing work they are doing at the centre at Plymouth University." Find out more information on the Brain Tumour Research Centre of Excellence at Plymouth University. Throughout the year we host a series of research laboratory tours. It's an opportunity to see the labs and ask questions to the scientists who undertake our world-leading research. Visitors will be looked after by our regional Brain Tumour Research representative and shown the ‘Wall of Hope’, created to celebrate those who help fund the research, recognised by personalised plaques and significant dates. Each plaque represents £2,740 raised – which is the running cost per day of the laboratories. Whether you are already a fundraiser or would like to be, or just have an interest in the amazing research that happens here, please get in touch to book a place on a tour. View the scheduled lab tours for this year. Watch our video about our lab tours.